Council is proposing to revoke the recreation reserve status of 6,952m2 of land as part of Marine Park (total 112,369m2) to enable the University of Waikato to develop a new marine research and educational facility. Submissions are now closed. Many thanks for your feedback. What is the proposal about? Tauranga City Council is proposing to seek revocation of the recreation reserve status from an area of land at Marine Park. This is to enable a potential long-term lease of the land to the University of Waikato in order to establish a new marine research and educational facility. An assessment of Marine Park took existing as well as planned activities into account and presented a feasible location where the University could potentially develop a new marine research and educational facility. A decision on whether or not to proceed to seek revocation will be made following consideration of the feedback received. A decision to revoke the recreation reserve status of this area of land ultimately sits with the Minister of Conservation. Marine Park is a reserve at Sulphur Point, held as Recreation Reserve under the Reserves Act 1977. The identified area for the proposed revocation is located in the middle of Marine Park and is 6,952m2. It is located adjacent to the grassed overflow car and trailer park. The identified area meets the anticipated size required for the University to establish the facility, consisting of a two storey building (approximately 2,400m2), yard space and car parks. Public access to the water’s edge will be maintained with the proposed development set back accordingly. This will maintain a pedestrian link along the coastal edge connecting the northern and southern parts of the reserve. In 2016 the University approached Council with the wish to work collaboratively towards establishing a multidisciplinary research and educational facility close to the city centre with a strong focus and influence on sustaining Tauranga Moana and researching environmental health. The initial investigation included both privately owned and Council owned land. This was narrowed down to two areas at Sulphur Point which had the potential for a suitable site. 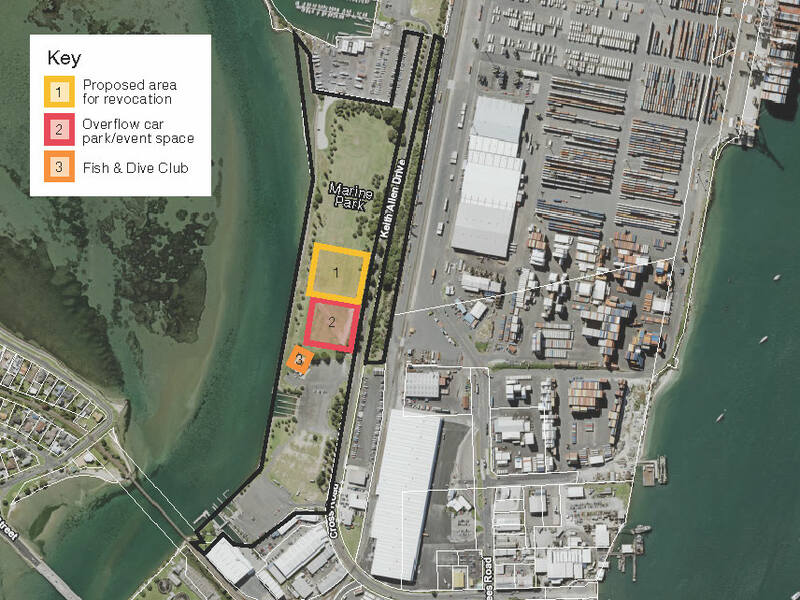 In December 2017, an open space area at Northern Sulphur Point, adjacent to the Tauranga Sport Fishing Club, was determined as the most feasible site for this potential development. After considering community feedback, the area of land at Northern Sulphur Point was removed from further consideration and Councillors agreed to assess Marine Park to identify a potential site. What does a marine research and educational facility mean for our city? The proposed research centre would be distinctive to New Zealand and create the capacity to attract and host national and international collaborations and research programmes. It would expand the capability to protect Tauranga’s and New Zealand’s marine environment by providing opportunities and solutions to key issues for the Bay of Plenty coastal and marine environments. By providing tertiary education opportunities unique to New Zealand, the world-class centre would help keep more young people in the area by enabling them to study courses unique to New Zealand. Whilst the facility would not be a commercial operation, significant direct economic benefits to the city are expected through growth in student, researcher and administrative staff numbers; new local and international research; development partnerships and conferences as well as the development of marine products and technologies. The facility would put Tauranga on the map as a home of world-class research specialised in marine research, biotech and engineering, and tertiary education. The University of Waikato is looking for a location within Tauranga to build a new, purpose-built, world class Marine Research and Educational Facility. Due to the bespoke requirements for such a facility, there is very limited privately owned land suitable and available in Tauranga. The University approached Council to understand whether Council would look at the potential of utilising public land should there be land that meets the bespoke requirements. The significant economic development opportunity and environmental, cultural and social value that such a facility would bring to Tauranga was presented to the Economic Development and Investment Committee in May 2017. At the meeting, Council approved to investigate Council owned land in Tauranga to understand whether any areas were feasible sites for the development of the new facility. After a review of the investigation, which was presented to Council in July 2017, two areas on Sulphur Point were short-listed and a further investigation was approved. Following this further investigation, an area of open space land on northern Sulphur Point was identified as being the most feasible site from both the Council’s perspective and from the University’s perspective. Council approved the outcome of the further investigation and agreed to consider the potential for a long-term lease of the area of open space land to the University subject to public consultation and negotiating terms and conditions with the University. Council carried out formal consultation from Monday, 12 February to Friday, 9 March 2018 regarding the proposal to long-term lease the land to the University for the purpose of establishing a new Marine Research & Educational Facility. The consultation outcomes for the area of open space land at northern Sulphur Point were considered by the Economic Development and Investment Committee in June 2018 and included ratification at the full Council meeting in July 2018. Council considered the consultation outcomes for the area of open space land at northern Sulphur Point in July 2018 and as a result the site has been removed from further consideration. Council resolved to investigate Marine Park for a potential location to establish a purpose-built Marine Research and Educational Facility. The recreation reserve Marine Park at Sulphur Point has been assessed and a potential site for the establishment of a purpose-built Marine Research and Educational Facility identified.